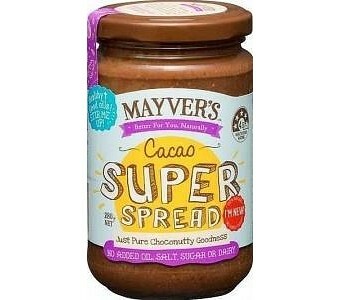 Mayver's Cacao Super Spread is a healthy snack choice, as it is sugar free and made up of entirely natural ingredients. Naturally sweetened with dates, it's a high energy, dairy and gluten free chocolate flavoured alternative to other chocolate spreads. With the addition of Chia, it provides a quick energy fix, when on the go. Spread it on bread or crispbreads or crackers, add to Smoothies or just enjoy it straight out of the jar! Ingredients: Peanuts, Almonds, Cashews, Brazil Nuts, Dates, Cacao Powder (2.7%),Chia Seeds, Sesame Seeds, Natural Vanilla Flavour.